The addition of standing pergolas to your backyard is an excellent way to enhance the beauty of your home in Rochester, New York, or a surrounding area. Thankfully, the professionals at Pro Home and Sunrooms have proudly served the area since 1967 by offering high-quality TEMO structures to local homeowners. The durable products we offer are made with the needs of homeowners in mind and are able to withstand everything Mother Nature has to offer. In fact, thanks to the TEMKOR cladding found in our free standing pergolas and all other shading structures, you will be receiving one of the most low-maintenance pergolas in the industry. A free standing pergola is the perfect solution for those who want to add shade to an area that is not currently covered. Pro Home and Sunrooms also provides attached pergolas but with the convenience of a free standing structure, you will be able to have a shaded retreat anywhere on your property. 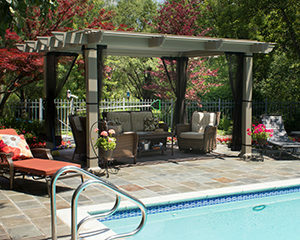 To learn more about the free standing pergolas we offer to homeowners in Rochester, NY, and the surrounding areas, contact Pro Home and Sunrooms today. Make sure to ask about the convenient financing options available to all qualifying homeowners.